Developer Quote: " Polaris Office is a mobile office solution which allows you to view/edit MS Office documents on your iphone/iPad. 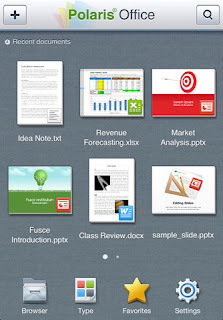 In addition to that, it also supports viewing/editing of text files as well as reading PDF and HWP!" The serious professional needs access to serious office tools in order to get the job done, no matter when or where. That's why having Polaris Office on your iPhone and iPad is so important. Free apps are wonderful, but there are times it is worth it to pay a little bit, and this app is so comprehensive and can be such a boon to your productivity that you'll consider the minimal cost to be negligible in comparison to the value you receive. Polaris Office gives you the ability to read and edit Microsoft Office documents, as well as view PDF and HWP documents. But the app doesn't just let you do these things. It also allows you to do them in such a way as to make the process enjoyable and easy, which goes a long way toward enhancing productivity on the go. It's not only pleasing to the eye, it's also intuitive. So when you have work to do away from the office, you're actually going to enjoy it! Polaris Office makes accessing your documents away from the office as simple as connecting to the Cloud, using Google Docs, Dropbox, and Box.net with more cloud services to be added later. - Slideshows (Pointer and slide note) and it shows inserted animation as well. First of all, to give you a heads up, you can download the user manual for Polaris Office here to get you rolling along easily with your productivity. Downloading documents from your Cloud services is as simple as tapping on the Storage tab at the bottom of the Home screen and adding the services you want to access. Once added, you can easily find your stored documents and open/edit as needed. Accessing locally stored documents is a snap, accomplished by tapping "On Phone" in your Storage screen. What about creating new documents directly on your device? Simple. 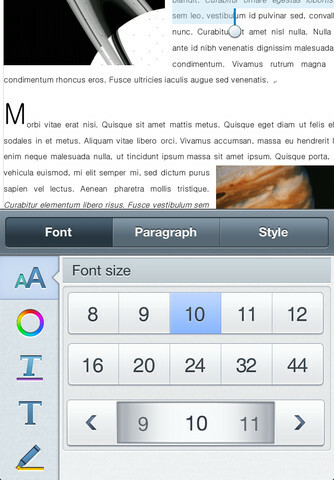 From the Home screen, tap on Doc Type, then choose from Doc, Sheet, Slide, PDF or TXT. You'll be given a nice choice of templates that come with the app in order to create the perfect document for your needs. Tons of User Tips and an excellent Tutorial make it pleasantly smooth and easy to work through this flexible, multi-use mobile office software app. COOL CONCLUSION: Polaris Office is a bargain and a gem, especially at the current price. It is sure to enhance your motivation to get the work done no matter where you are, based on its ease of use and visual attractiveness. --iOS/Age Rating: Requires iOS 5.0 or later. Rated 4+. --Device: Universal: Compatible with iPhone, iPod touch, and iPad.